Chichén Itzá, one of the best-​known archaeological sites of the Maya civilization, has a split personality. The site is located in the northern Yucatan peninsula of Mexico, about 90 miles from the coast. The south half of the site, called Old Chichén, was constructed beginning about 700 AD, by Maya emigres from the Puuc region of southern Yucatan. The Itza built temples and palaces at Chichén Itzá including the Red House (Casa Colorada) and the Nunnery (Casa de las Monejas). The Toltec component of Chichén Itzá arrived from Tula and their influence can be seen in the the Osario (the High Priest’s Grave), and the Eagle and Jaguar Platforms. Most interestingly, a cosmopolitan blending of the two created the Observatory (the Caracol) and the Temple of the Warriors. This little building is an exemplary form of a Puuc (pronounced ‘pook’) house. 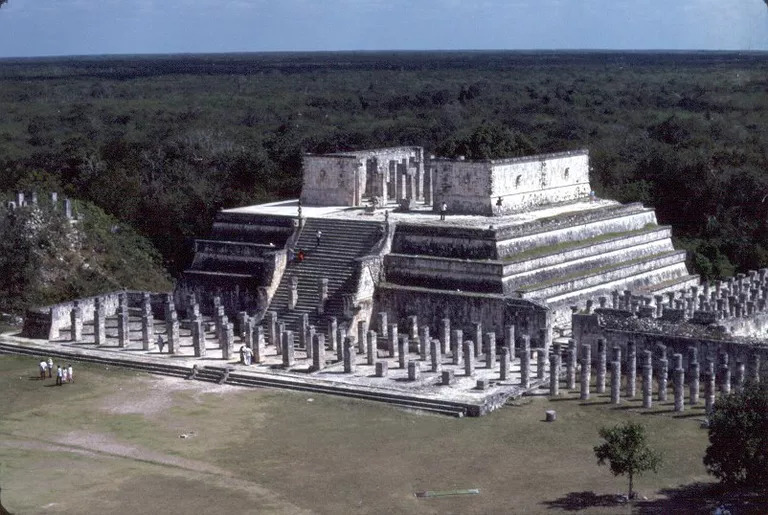 Puuc is the name of the hill country in the Yucatan peninsula of Mexico, and their homeland included the big centers of Uxmal, Kabah, Labna, and Sayil. Mayanist Falken Forshaw adds: The original founders of Chichén Itzá are the Itzá, who are known to have migrated from the Lake Peten area in the southern Lowlands, based on linguistic evidence and post-contact Maya documents, taking about 20 years to complete the journey. It’s a very complex story, as there were settlements and culture in the North since before the current age. 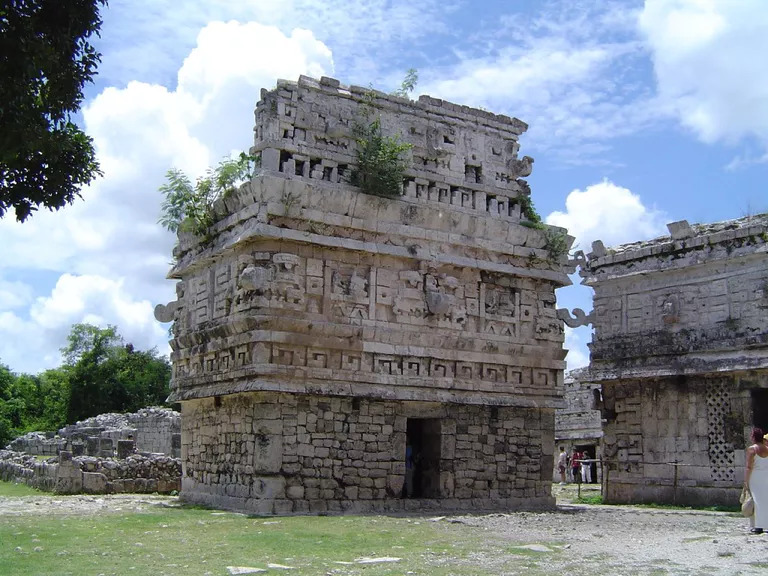 The Puuc style of architecture consisted of veneer stones cemented in place over a rubble core, stone roofs with corbeled vaulting and intricately detailed facades in geometric and mosaic stone veneers. The smaller structures like this one have plain plastered lower elements combined with an intricate roof comb–that’s the free-standing tiara on the top of the building, in this case with a lattice crust mosaic. The roof design in this structure has two Chac masks looking out; Chac is the name of the Mayan Rain God, one of the dedicatory gods of Chichén Itzá. Falken adds: What used to be called Chac masks are now thought to be “witz” or mountain deities that inhabit mountains, especially those at the midpoints of the cosmic square. Thus these masks bestow a quality of “mountain” to the building. Chac Masks – Masks of the Rain God or Those of the Mountain Gods? One of the Puuc characteristics seen in architecture of Chichén Itzá is the presence of three-dimensional masks of what was traditionally believed to be the Maya god of rain and lightning Chac or God B. This god is one of the earliest identified Maya deities, with traces back to the beginnings of the Maya civilization (ca. 100 BC-AD 100). Variants of the rain god’s name include Chac Xib Chac and Yaxha Chac. The earliest portions of Chichén Itzá were dedicated to Chac. Many of the earliest buildings at Chichen have three-dimensional Witz masks embedded into their veneers. They were made in stone pieces, with a long curly nose. On the edge of this building can be seen three Chac masks; also take a look at the building called the Nunnery Annex, which has Witz masks in it, and the whole facade of the building is constructed to look like a Witz mask. 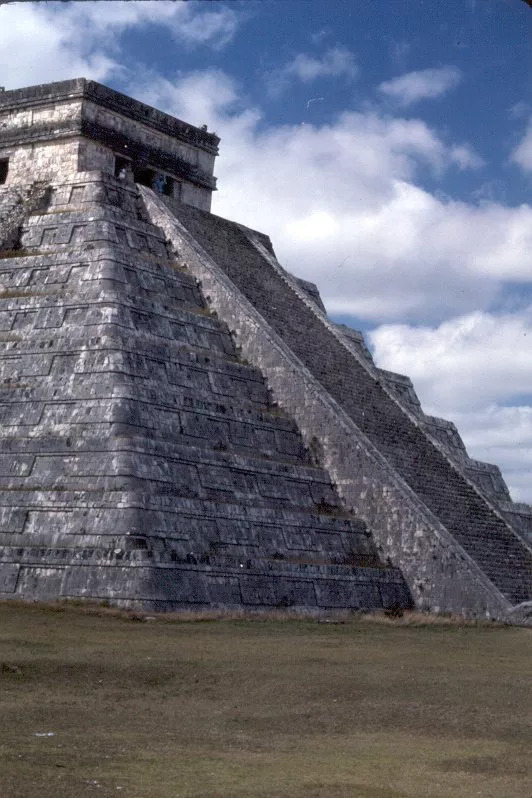 Beginning about 950 AD, a new style of architecture crept into the buildings at Chichén Itzá, no doubt along with the people and the culture: The Toltecs. The term ‘Toltecs’ means a lot of things to a lot of people, but in this feature we’re talking about people from the town of Tula, in what is now Hidalgo state, Mexico, who began to expand their dynastic control into distant regions of Mesoamerica from the fall of Teotihuacan to the 12th century AD. 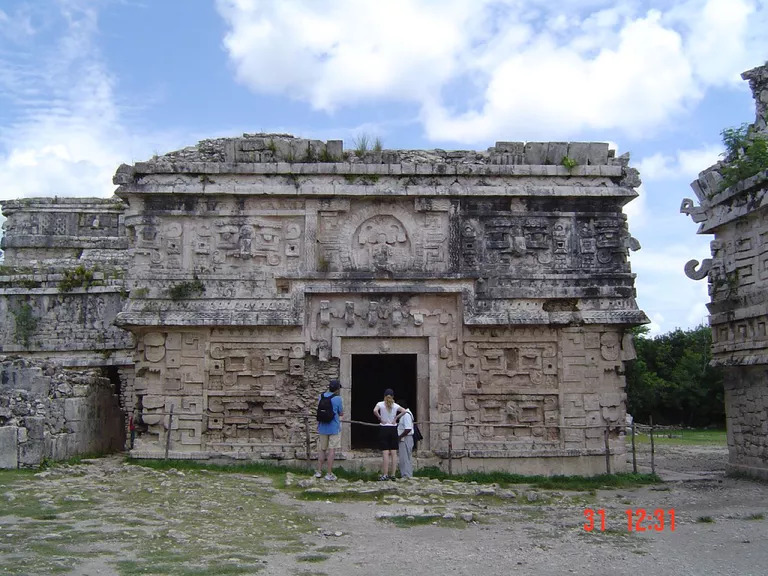 While the exact relationship between the Itzas and the Toltecs from Tula is complex, it is certain that major changes in architecture and iconography took place at Chichén Itzá as a result of an influx of Toltec people. The result was probably a ruling class made up of Yucatec Maya, Toltecs, and Itzas; it is possible that some of the Maya were also at Tula. Toltec style includes the presence of the feathered or plumed serpent, called Kukulcan or Quetzalcoatl, chacmools, the Tzompantli skull rack, and Toltec warriors. 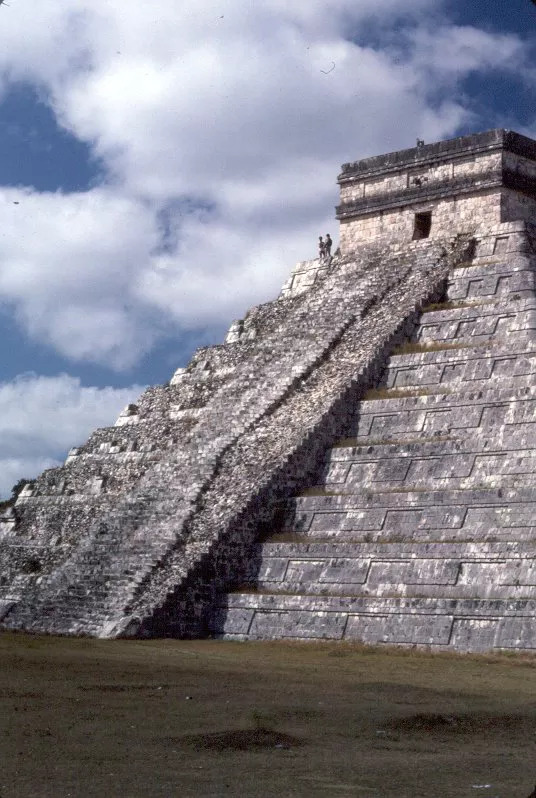 They are probably the impetus for the increase of emphasis on death culture at Chichén Itzá and elsewhere, including the frequency of human sacrifice and warfare. Architecturally, the elements of colonnades and columned halls with wall benches; pyramids are built of stacked platforms of decreasing size in the “tablud and tablero” style which developed at Teotihuacan. Tablud and tablero refers to the angled stair-step profile of the stacked platform pyramid, seen here in this profile shot of el Castillo. This building was named la Iglesia (the Church) by the Spanish, probably simply because it was located right next to the Nunnery. 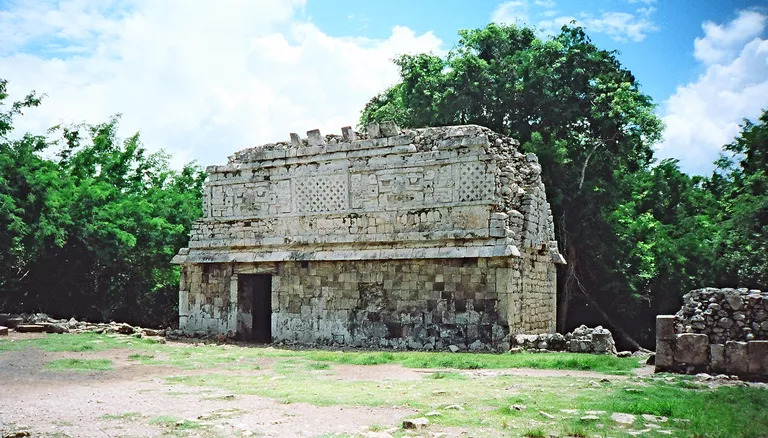 This rectangular building is of classic Puuc construction with an overlay of central Yucatan styles (Chenes). This is probably one of the most frequently drawn and photographed buildings at Chichén Itzá; famous 19th-century drawings were made by both Frederick Catherwood and Desiré Charnay. The Iglesia is rectangular with a single room inside and an entrance on the west side. The outside wall is completely covered with veneer decorations, which extend clear up to the roof comb. The frieze is bounded at ground level by a stepped fret motif and above by a serpent; the stepped fret motif is repeated on the bottom of the roof comb. The most important motif of the decoration is the Chac god mask with a hooked nose standing out on the corners of the building. In addition, there are four figures in pairs between the masks including an armadillo, a snail, a turtle, and a crab, who are the four “bacabs” who hold up the sky in Maya mythology. The High Priest’s Grave is the name given to this pyramid because it contains an ossuary–a communal graveyard–beneath its foundations. The building itself shows combined Toltec and Puuc characteristics and is definitely reminiscent of el Castillo. The High Priest’s Grave includes a pyramid of about 30 feet high with four stairways on each side, with a sanctuary in the center and a gallery with a portico in the front. The sides of the stairways are decorated with interlaced feathered serpents. Pillars associated with this building are in the form of the Toltec feathered serpent and human figures. Between the first two pillars is a square stone-lined vertical shaft in the floor which extends downwards to the base of the pyramid, where it opens up on a natural cavern. The cave is 36 feet deep and when it was excavated, bones from several human burials were identified along with grave goods and offerings of jade, shell, rock crystal and copper bells. 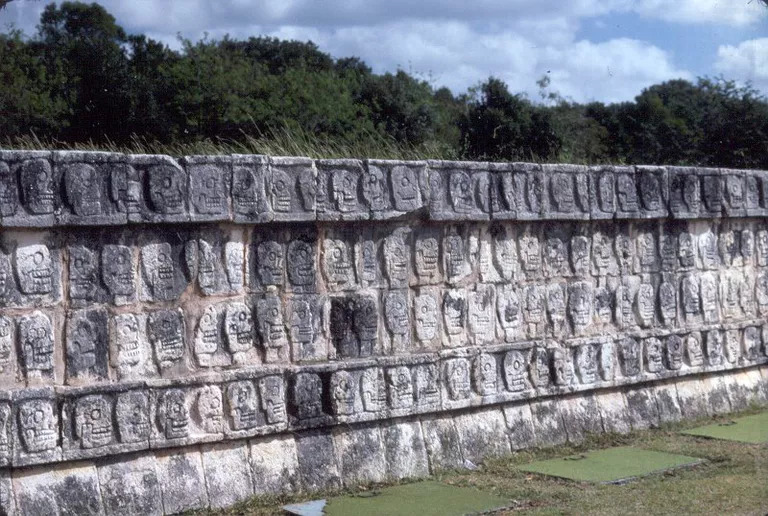 The Wall of Skulls is called the Tzompantli, which is actually an Aztec name for this kind of structure because the first one seen by the horrified Spanish was at the Aztec capital city of Tenochtitlan. The Tzompantli structure at Chichén Itzá is a Toltec structure, where the heads of sacrificial victims were placed; although it was one of three platforms in the Great Plaza, it was according to Bishop Landa, the only one for this purpose–the others were for farces and comedies, showing the Itzá’s were all about fun. The platform walls of the Tzompantli have carved reliefs of four different subjects. The primary subject is the skull rack itself; others show a scene with a human sacrifice; eagles eating human hearts; and skeletonized warriors with shields and arrows. The Temple of the Warriors is one of the most impressive structures at Chichén Itzá. It may be the only known late classic Maya building sufficiently big enough for really large gatherings. 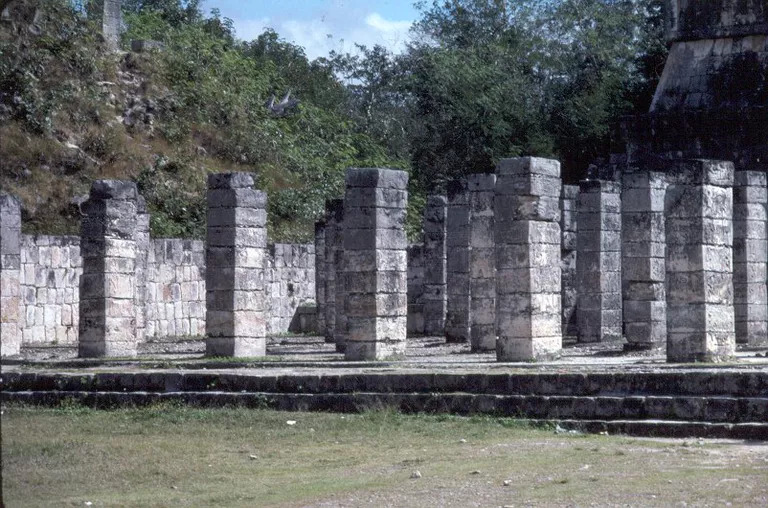 The temple consists of four platforms, flanked on the west and south sides by 200 round and square columns. The square columns are carved in low relief, with ​Toltec warriors; in some places they are cemented together in sections, covered with plaster and painted in brilliant colors. The Temple of Warriors is approached by a broad stairway with a plain, stepped ramp on either side, each ramp has figures of standard-bearers to hold flags. A chacmool reclined before the main entrance. On the top, S-shaped serpent columns supported wooden lintels (now gone) above the doorways. Decorative features on the head of each serpent and astronomical signs are carved over the eyes. On the top of each serpent head is a shallow basin that might have been used as an oil lamp. The Market (or Mercado) was named by the Spanish, but its precise function is under debate by scholars. It is a large, colonnaded building with a spacious interior court. The interior gallery space is open and unpartioned and a large patio lies in front of the only entrance, accessed by a broad stairway. There were three hearths and grinding stones found in this structure, which scholars normally interpret as evidence of domestic activities–but because the building offers no privacy, scholars believe it was likely a ceremonial or council house function. This building clearly is of Toltec construction. Mayanist Falken Forshaw updates: Shannon Plank in her recent dissertation argues this as a place for fire ceremonies. 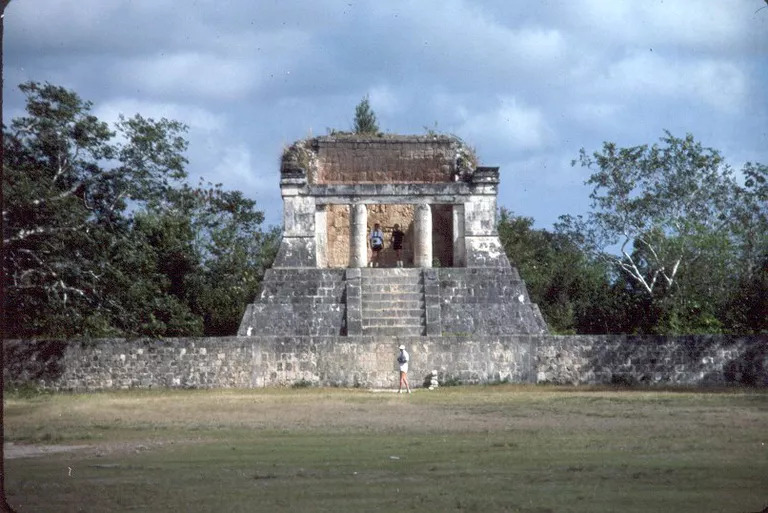 The Temple of the Bearded Man is located at the north end of the Great Ball Court, and it is called the Temple of the Bearded Man because of the several representations of bearded individuals. There are other images of the ‘bearded man’ in Chichén Itzá; and a famous story told about these images was confessed by the archaeologist/explorer Augustus Le Plongeon in his book Vestiges of the Maya about his visit to Chichén Itzá in 1875. “On one of the [pillars] at the entrance on the north side [of El Castillo] is the portrait of a warrior wearing a long, straight, pointed beard…. I placed my head against the stone so as to represent the same position of my face… and called the attention of my Indians to the similarity of his and my own features. They followed every lineament of the faces with their fingers to the very point of the beard, and soon uttered an exclamation of astonishment: ‘Thou! Here!”. Not one of the high points in archaeological history, I’m afraid. For more on the wackiness of Augustus Le Plongeon, see Romancing the Maya, a terrific book on 19th-century exploration of Maya sites by R. Tripp Evans, where I found this story. The Great Ball Court at Chichén Itzá is the largest in all of Mesoamerica, with an I-shaped playing ground 150 meters long and a small temple at either end. This photograph shows the south 1/2 of the ball court, the bottom of the I and a portion of the game walls. The tall game walls are on both sides of main playing alley, and stone rings are set high in these side walls, presumably for shooting balls through. Reliefs along the lower parts of these walls depict the ancient ball game ritual, including the sacrifice of the losers by the victors. 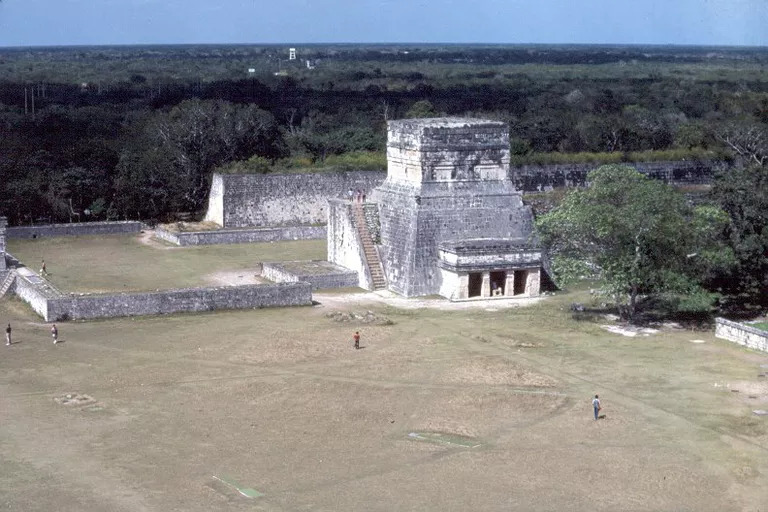 The very large building is called the Temple of the Jaguars, which looks down into the ball court from the east platform, with a lower chamber opening outside into the main plaza. The second story of the Temple of Jaguars is reached by an extremely steep stairway at the east end of the court, visible in this photo. The balustrade of this staircase is carved to represent a feathered serpent. Serpent columns support the lintels of the wide doorway facing the plaza, and the doorjambs are decorated with typical Toltec warrior themes. A frieze appears here of a jaguar and circular shield motif in a flat relief, similar to that found at Tula. In the chamber is a now badly defaced mural of a battle scene with hundreds of warriors laying siege to a Maya village. The crazed explorer Augustus Le Plongeon interpreted the battle scene in the interior of the Temple of the Jaguars (thought by modern scholars to be the 9th century sack of Piedras Negras) as the battle between Prince Coh leader of Moo (Le Plongeon’s name for Chichén Itzá) and Prince Aac (Le Plongeon’s name for the leader of Uxmal), which was lost by Prince Coh. Coh’s widow (now Queen Moo) had to marry Prince Aac and she cursed Moo to destruction. Afterwards, according to Le Plongeon, Queen Moo left Mexico for Egypt and becomes Isis, and eventually is reincarnated as–surprise! Le Plongeon’s wife Alice. This photograph is of the stone rings on the inside wall of the Great Ball Court. Several different ball games were played by various groups in similar ballcourts throughout Mesoamerica. The most wide-spread game was with a rubber ball and, according to the paintings at various sites, a player used his hips to keep the ball in the air as long as possible. According to ethnographic studies of more recent versions, points were scored when the ball hit the ground in the opposing players’ part of the courtyard. The rings were tenoned into the upper side walls; but passing the ball through such a ring, in this case, 20 feet off the ground, must have been darned near impossible. Ballgame equipment included in some cases padding for the hips and knees, a hacha (a hafted blunt axe) and a palma, a palm-shaped stone device attached to the padding. It is unclear what these were used for. The sloping benches on the side of the court were probably sloped to keep the ball in play. They are carved with reliefs of the victory celebrations. These reliefs are each 40 feet long, in panels at three intervals, and they all show a victorious ball team holding the severed head of one of the losers, seven snakes and green vegetation representing the blood issuing from the player’s neck. This is not the only ball court at Chichén Itzá; there are at least 12 others, most of which are smaller, traditionally Maya sized ball courts. 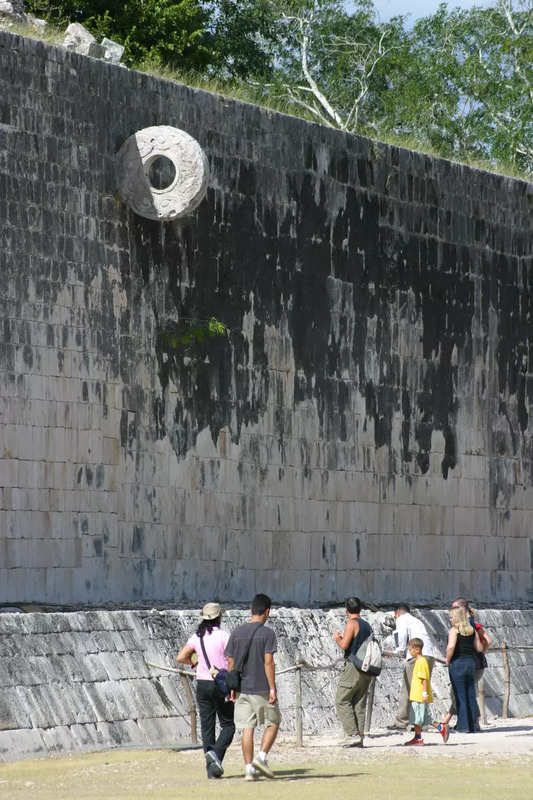 The Observatory at Chichén Itzá is called el Caracol (or snail in Spanish) because it has an interior staircase that spirals upward like a snail’s shell. 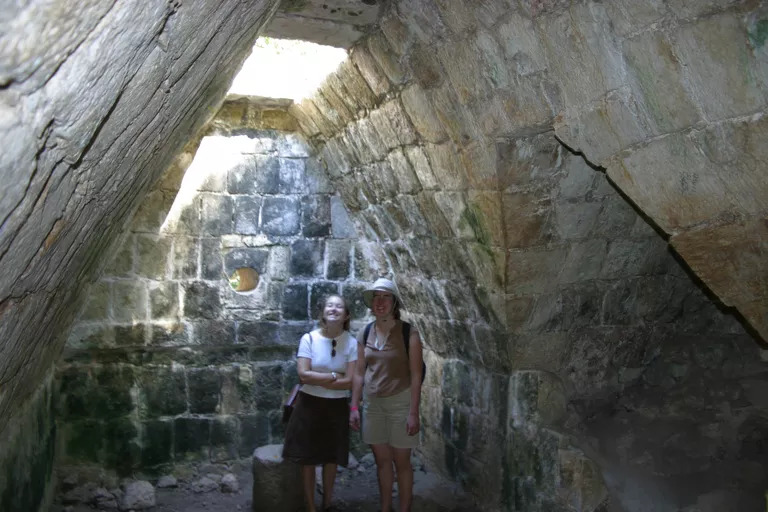 The round, concentrically-vaulted Caracol was built and rebuilt several times over its use, in part, scholars believe, to calibrate the astronomical observations. The first structure was probably built here during the transition period of the late 9th century and consisted of a large rectangular platform with a stairway on its west side. A round tower of about 48 feet high was built atop the platform, with a solid lower body, a central portion with two circular galleries and a spiral staircase and an observation chamber on the top. Later, a circular and then a rectangular platform was added. The windows in the Caracol point in the cardinal and subcardinal directions and are believed to enable the tracking of the movement of Venus, the Pleides, the sun and the moon and other celestial events. 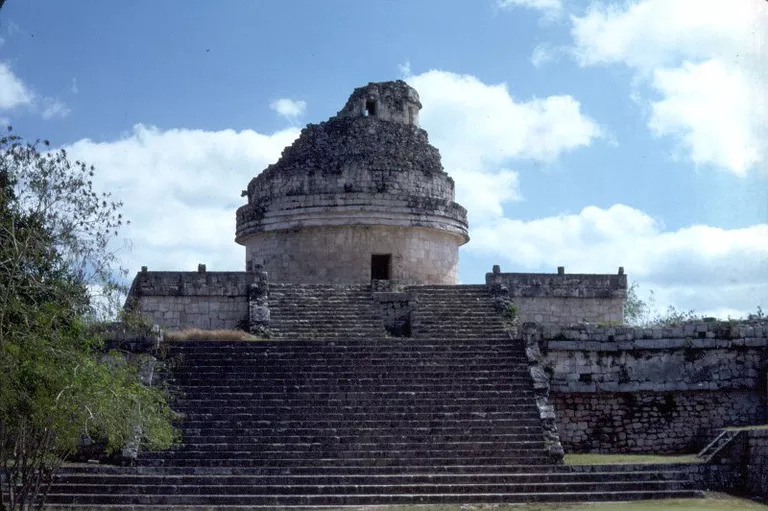 Mayanist J. Eric Thompson once described the Observatory as “hideous… a two-decker wedding cake on the square carton in which it came.” For a complete discussion of the archaeoastronomy of el Caracol, see Anthony Aveni’s classic Skywatchers. If you’re interested in ancient observatories, there are lots more to read about. Sweat baths–enclosed chambers heated with rocks–were and are a construction built by many societies in Mesoamerica and in fact, most of the world. They were used for hygiene and curing and are sometimes associated with the ball courts. The basic design includes a sweating room, an oven, ventilation openings, flues, and drains. Maya words for sweat bath include kun (oven), pibna “house for steaming”, and chitin “oven”. This sweat bath is a Toltec addition to Chichén Itzá, and the whole structure consists of a small portico with benches, a steam room with a lower roof and two low benches where bathers could rest. In the rear of the structure was an oven in which the stones were heated. A walk separated the passageway from where heated rocks were placed and water thrown on them to produce the required steam. A small canal was built beneath the floor to assure proper drainage; and in the walls of the room are two small ventilation openings. Adjacent to the Temple of Warriors at Chichén Itzá are long colonnaded halls lined with benches. 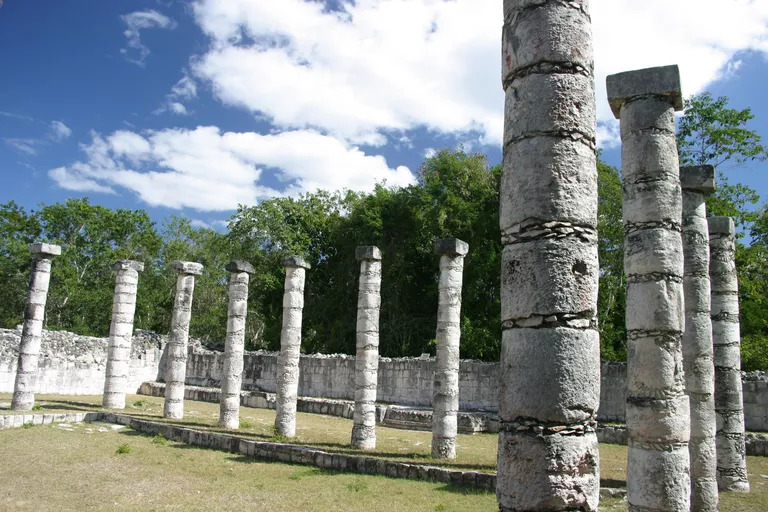 This colonnade borders a large adjacent court, combining civic, palace, administrative and market functions, and it is very Toltec in construction, quite similar to Pyramid B at Tula. Some scholars believe this feature, when compared to Puuc style architecture and iconography such as seen at the Iglesia, indicates that the Toltec replaced the religious-based leaders for warrior-priests. 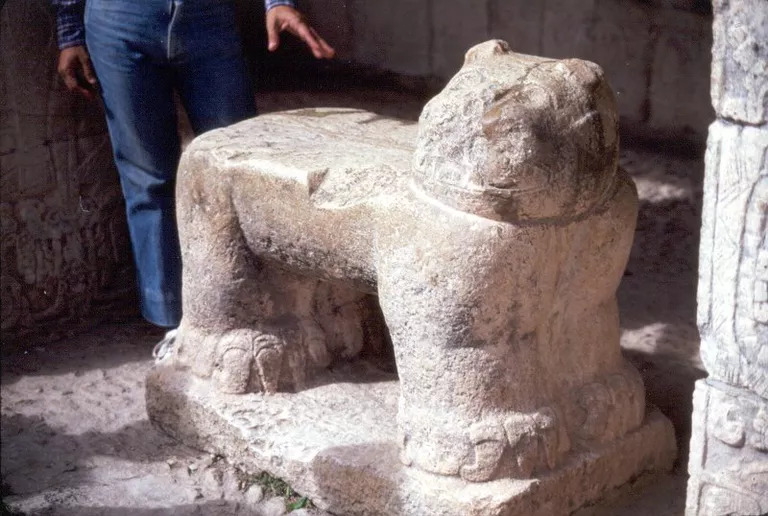 One frequently identified object at Chichén Itzá is a jaguar throne, a seat shaped like a jaguar presumably made for some of the rulers. This one is the only one left at the site open to the public; the remainder are in museums, because they are often richly painted with inlaid shell, jade and crystal features. Jaguar thrones were found in the Castillo and in the Nunnery Annex; they are often found illustrated on murals and pottery as well. The Castillo (or castle in Spanish) is the monument that people think of when they think of Chichén Itzá. It is mostly Toltec construction, and it probably dates to the period of the first combination of cultures in the 9th century AD at Chichén. El Castillo is centrally located on the south edge of the Great Plaza. The pyramid is 30 meters high and 55 meters on a side, and it was built with nine succeeding platforms with four staircases. The staircases have balustrades with carved feathered serpents, the open-jawed head at the foot and the rattle held high at the top. The last remodel of this monument included one of the fanciest jaguar thrones known from such sites, with red paint and jade insets for eyes and spots on the coat, and flaked chert fangs. The principal stairway and entrance is on the north side, and the central sanctuary is surrounded by a gallery with the main portico. 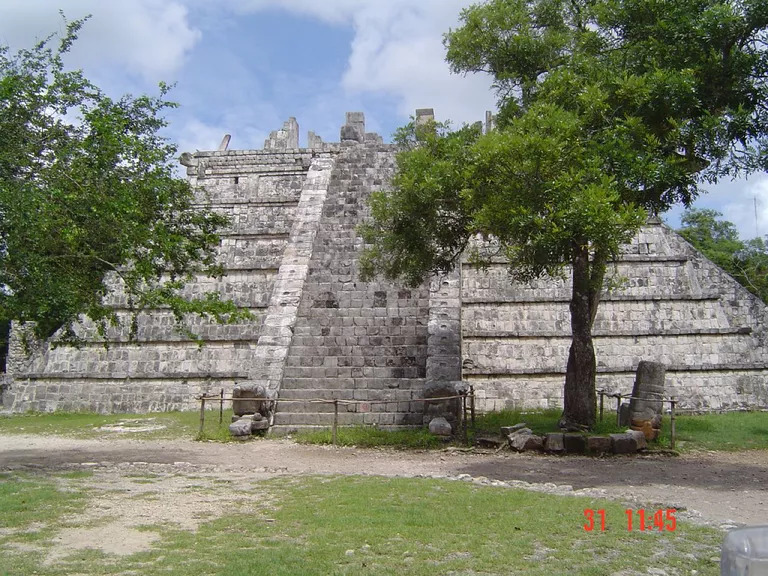 Information about the solar, Toltec, and Maya calendars is carefully built into el Castillo. Each stairway has exactly 91 steps, times four is 364 plus the top platform equals 365, the days in the solar calendar. The pyramid has 52 panels in the nine terraces; 52 is the number of years in the Toltec cycle. Each of the nine terraced steps are divided in two: 18 for the months in the yearly Maya calendar. Most impressively, though, is not the numbers game, but the fact that on the autumnal and vernal equinoxes, the sun shining on the platform edges forms shadows on the balustrades of the north face that look like a writhing rattlesnake. 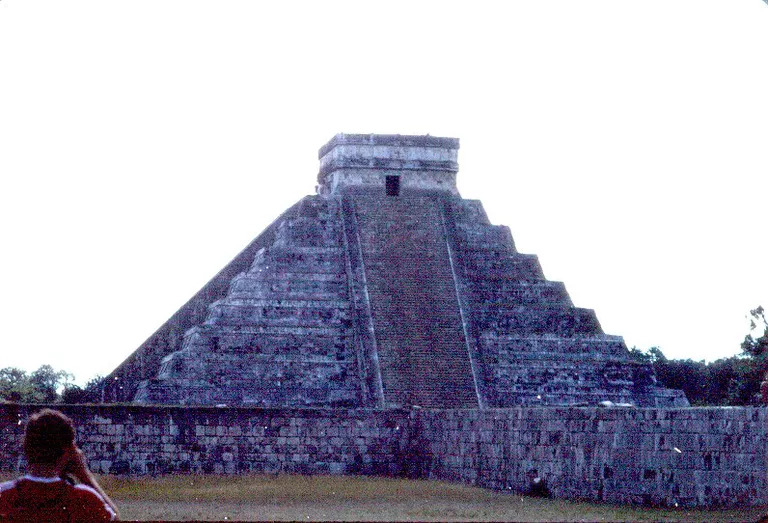 Archaeologist Edgar Lee Hewett described el Castillo as a design “of exceptionally high order, indicating great progress in architecture.” That most zealous of Spanish friar zealots Bishop Landa reported that the structure was called Kukulcan, or ‘feathered serpent’ pyramid, as if we needed to be told twice. The amazing equinoctial display at el Castillo (where the snake wriggles on the balustrades) was videotaped during Spring Equinox 2005 by Isabelle Hawkins and the Exploratorium. The videocast is in both Spanish and English versions, and the show lasts a good hour waiting for the clouds to part, but holy cow! is it worth watching. A close up of the balustrades on the north face of el Castillo, where the sundial aspects of the monument are seen during the equinoxes. The Nunnery Annex is located immediately adjacent to the Nunnery and while it is from the early Maya period of Chichén Itzá, it shows some influence of later residence. This building is of the Chenes style, which is a local Yucatan style. 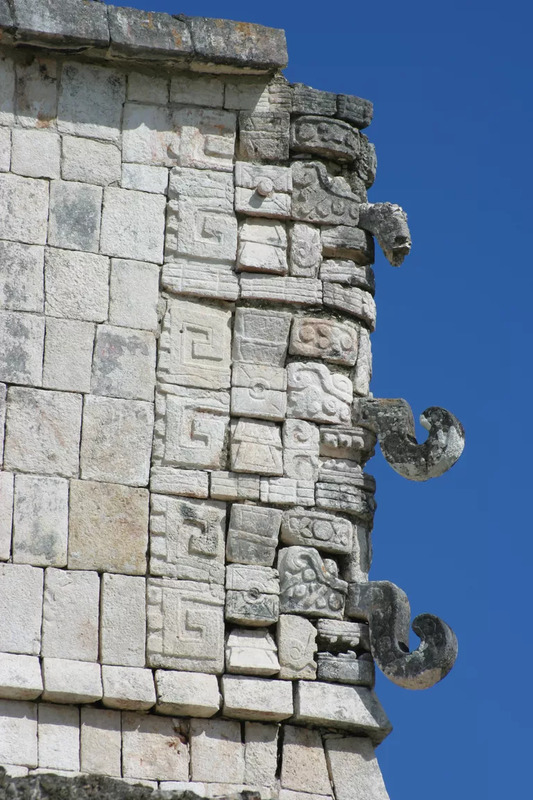 It has a lattice motif on the roof comb, complete with Chac masks, but it also includes an undulating serpent running along its cornice. The decoration begins at the base and goes up to the cornice, with the façade completely covered with several rain-god masks with a central richly clad human figure over the doorway. A hieroglyphic inscription is on the lintel. But the best thing about the Nunnery Annex is that, from a distance, the whole building is a chac (or witz) mask, with the human figure as the nose and the doorway the mouth of the mask. The heart of Chichén Itzá is the Sacred Cenote, dedicated to the Chac God, the Maya God of rain and lightening. Located 300 meters north of the Chichén Itzá compound, and connected to it by a causeway, the cenote was central to Chichén, and, in fact, the site is named after it–Chichén Itzá means “Mouth of the Well of the Itzas”. At the edge of this cenote is a small steam bath. The cenote is a natural formation, a karst cave tunneled into the limestone by moving groundwater, after which the ceiling collapsed, creating an opening at the surface. 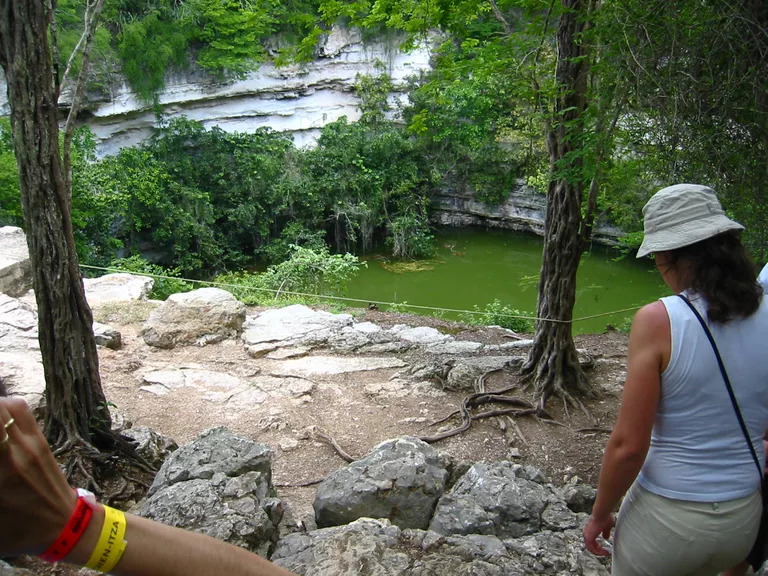 The opening of the Sacred Cenote is about 65 meters in diameter (and about an acre in area), with steep vertical sides some 60 feet above the water level. The water continues for another 40 feet and at the bottom is about 10 feet of mud. The use of this cenote was exclusively sacrificial and ceremonial; there is a second karst cave (called the Xtlotl Cenote, located in the center of Chichén Itzá) that was used as a source of water for Chichén Itzá’s residents. According to Bishop Landa, men, women, and children were thrown alive into it as a sacrifice to the gods in times of droughts (actually Bishop Landa reported the sacrificial victims were virgins, but that was probably a European concept meaningless to the Toltecs and Maya at Chichén Itzá). Archaeological evidence supports the use of the well as a location of human sacrifice. At the turn of the 20th century, American adventurer-archaeologist Edward H. Thompson bought Chichén Itzá and dredged the cenote, finding copperand gold bells, rings, masks, cups, figurines, embossed plaques. And, oh yes, many human bones of men, women. and children. Many of these objects are imports, dating between the 13th and 16th centuries AD after the residents had left Chichén Itzá; these represent the continued use of the cenote up into the Spanish colonization. These materials were shipped to the Peabody Museum in 1904 and repatriated to Mexico in the 1980s. This is another photograph of the karst pool called the Sacred Cenote or Well of the Sacrifices. You’ve got to admit, this green pea soup looks like one heck of a mysterious pool. When archaeologist Edward Thompson dredged the cenote in 1904, he discovered a thick layer of bright blue silt, 4.5-5 meters in thickness, settled at the bottom of the well remnants of the Maya blue pigment used as part of the rituals at Chichén Itzá. 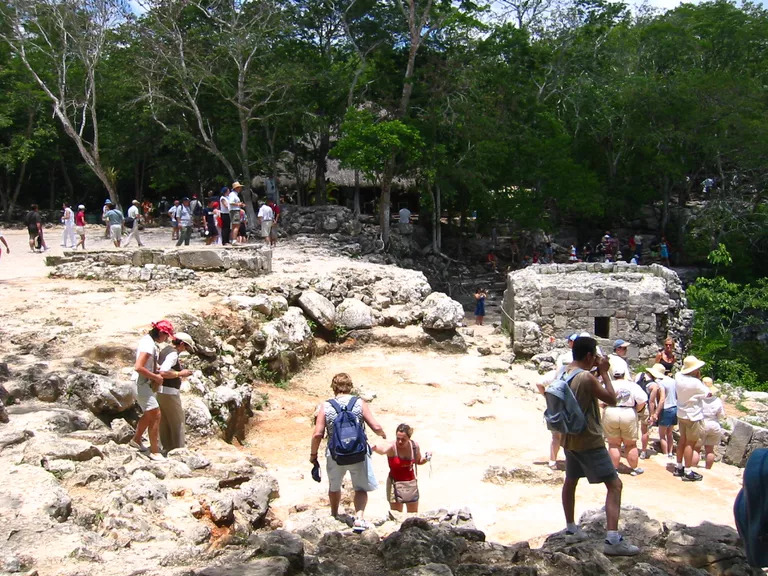 Although Thompson didn’t recognize that the substance was Maya Blue, recent investigations suggest that producing Maya Blue was part of the ritual of sacrifice at the Sacred Cenote. See Maya Blue: Rituals and Recipe for more information.